Your wallet will appreciate this. 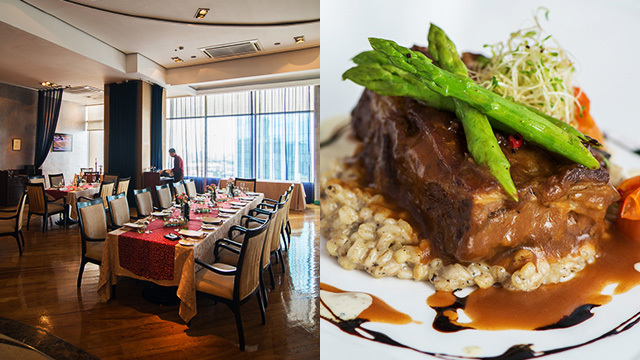 (SPOT.ph) For many of us, a steak dinner (or lunch) is strictly reserved for special occasions. That’s because we associate a high-quality steak with a steep price tag. But a good piece of beef doesn’t actually have to cost you thousands. 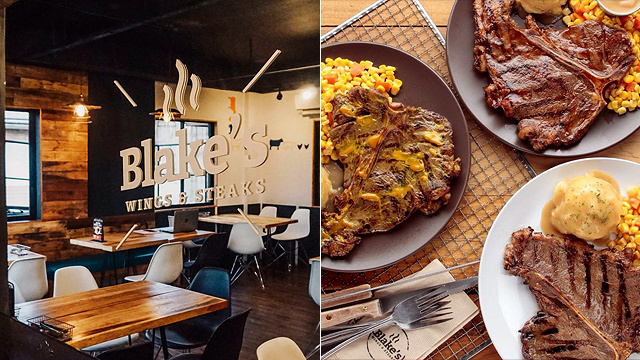 We’ve rounded up a list of 10 places right in Metro Manila, where you can get your steak fix for just under P1,000. With four branches already under their belt, the team at Blake’s Wings and Steaks proves that good steak doesn’t have to come at the expense of your wallet. Their signature steaks are all under P300 (P250/Porterhouse, P230/T-Bone), and you can have them in three flavors: Original, Hickory Barbeque, and Honey Mustard. They're also served with your own choice of gravy: Original, Mushroom, and Pepper Mushroom. See a list of Blake's Wings and Steak branches. 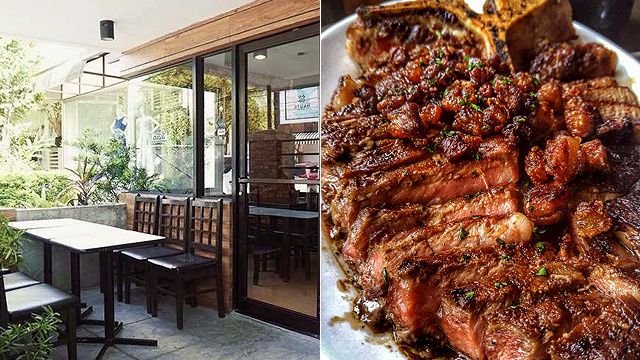 A car wash is probably the last place you’ll go to for a steak, but this cozy restaurant in Banawe cooks up the best budget steak in this side of Quezon City. Their TW Steak (P348), for example, may be thinner than most cuts of beef, but it still packs a lot of flavor. Their Rib-Eye (P358) is a lot heftier yet still tender and juicy. You can choose to customize your steak with three kinds of rubs: Zesty Mediterranean, sweet and savory Honey Garlic, or herby Old English rub. If you’re not from QC, don’t fret; they also have a second branch in Santa Cruz, Manila. See a list of Red Baron Ribs and Steaks branches. 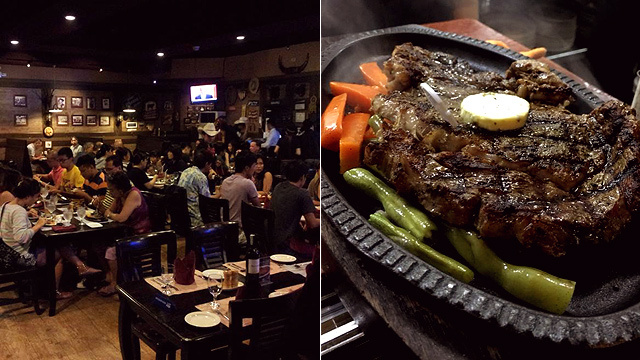 This restaurant along Maginhawa Street is popular among students and cash-strapped individuals for good reason: It’s where you can find one of the most affordable T-bone steaks in Metro Manila. Their signature Griddle Steak is just P180, and yet it’s just as good as any steak you’ll find in more expensive restaurants. 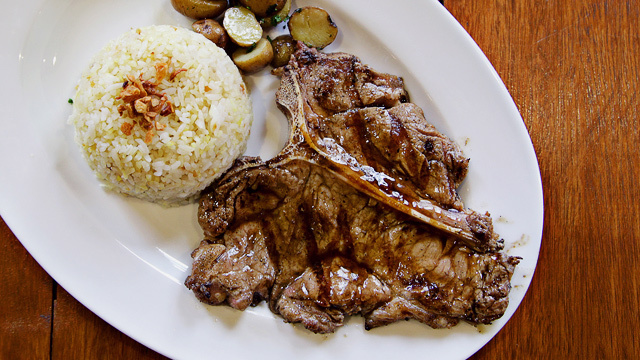 The T-bone is seasoned with a unique blend of herbs and spices and comes with a side of rice, veggies, and a generous amount of gravy. Griddle: Steaks X Chicken is at 106-B Maginhawa Street, Teachers Village, Diliman, Quezon City. Founded by Chef Victor Daluz Jr. who trained in the United States, Vittorio’s delivers U.S. Angus-beef steaks that are not only perfectly grilled and seasoned; they also come at an affordable price tag. The restaurant has a wide selection of cuts available, but the Rib Eye (P875), lean with a good amount of marbling, is one of their bestsellers. It’s cooked however way you like it, and comes with a peppery sauce, a heaping amount of steak fried rice, and mixed vegetables on the side. 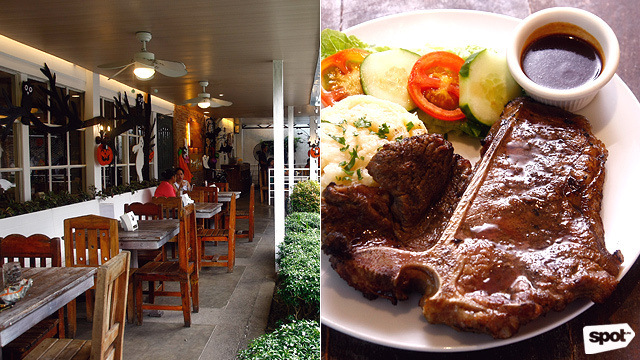 Vittorio's Steak House is at 32 Scout Borromeo, Diliman, Quezon City. Stoned Steaks takes the novel idea of cooking your steak on a hot lava stone and makes it fairly affordable. While the restaurant does offer pricier cuts of beef like Wagyu for those looking to indulge, their Sirloin cut (P950 for 220g) is just as tender and juicy. Not only can you choose to have it cooked well done, medium, or rare, you also have a wide array of sauces (seven in fact!) to choose from. Pair the steak with either the Kimchi Fried Rice for a spicy kick or the Steak Rice, for a more indulgent treat. Stoned Steaks is at 55 Scout Rallos, Diliman, Quezon City. Beefalo by Hotrocks is worth the drive to Marikina. Their Porterhouse (P395/250 grams; P650/450 grams) is a hefty piece of beef that’s worth more than its price tag. Another affordable favorite is the Breakfast Steak (P180), which, despite its name, is actually available all day. It comes with a fried egg, mashed potatoes, and a side salad. Beefaly by Hotrocks is at Lot 6, Block 3, Mayor Gil Fernando Avenue, Sto. Niño, Marikina City. 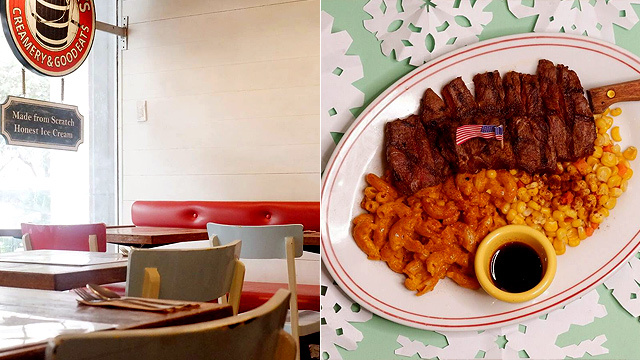 This diner located in the heart of Quezon City Circle keeps its steak prices low by sourcing all of their meat locally. But that doesn’t mean they skimp on the quality. Their four types of steak—Ribeye (P260), Porterhouse (P280), T-Bone (P168), and Filet Mignon (P280)—are all cooked to tender perfection. You can pair your chosen cut of beef with two sides, ranging from java, steamed, and garlic rice, to coleslaw, mashed potatoes, mixed vegetables, and roasted baby potatoes. There are even three kind of sauces to choose from, like the classic mushroom gravy, spicy pepper gravy and the tangy chimichurri sauce. Steak to One is at Quezon Memorial Circle, Diliman, Quezon City. With their open-air dining area and plastic chairs, Snackaroo really does seem like a far cry from fancy steakhouses. But trust us when we say that their steaks are as satisfying as any high-end restaurant’s. 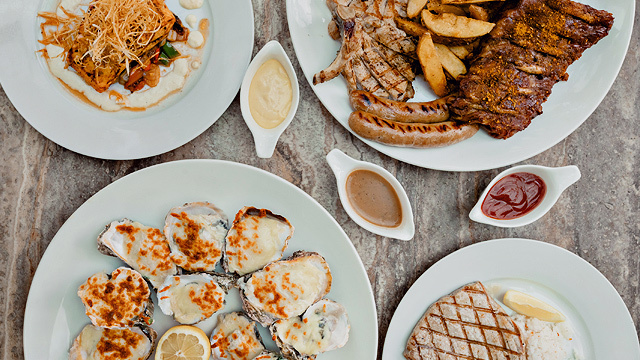 Their bestsellers, the T-Bone (P160) and Porterhouse (P160), are grilled over hot coals, resulting in a crispy outer layer and a perfectly tender center. Dip it in their peppery gravy and some Worcestershire sauce to help bring out the meat’s natural juices. Snackaroo is at 8 Judge Jimenez Street, Quezon City. This Texas-inspired joint is a favorite among those living in the South and for good reason. Wooden Horse Steakhouse prides itself on their high-quality steaks, serving only 100% Certified Angus Beef. With a Japanese chef in control of the kitchen, Wooden Horse marinates their beef with soy sauce rather than your usual salt and pepper. Check out the Dice Cut Steak (P495), which is served on top of a sizzling plate alongside some sautéed bean sprouts. 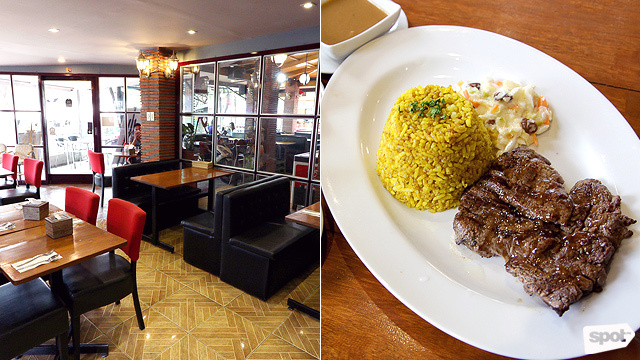 Wooden Horse Steakhouse is at G/F Molito Commercial Complex, Madrigal Avenue, Muntinlupa City. Mad Mark’s may be best known for their unique ice-cream flavors, but did you know they also serve up pretty good steak? 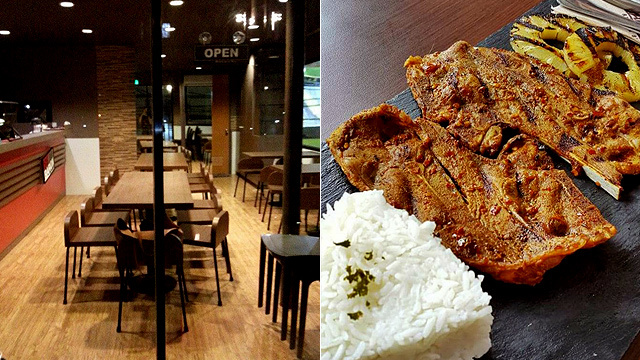 Their Signature Steak (P349), a thick top-blade steak, rivals even those in pricier restaurants. It’s soft, chewy, and tender, and comes with your own choice of sauce and two sides. Those on a tighter budget, meanwhile, can opt for the Daily Steak (P265), which is just as indulgent. See a list of Mad Mark's Creamery and Good Eats branches.